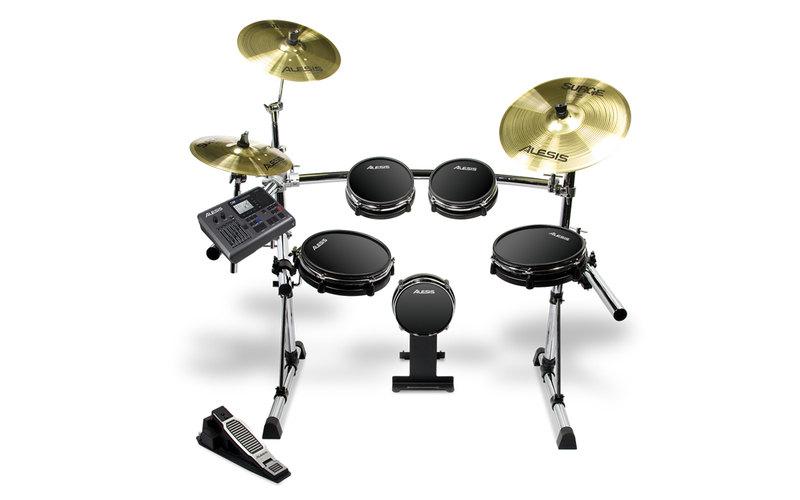 The DM10 Pro Kit has Alesis’ acoustic-feeling RealHead pads in eight and 10-inch sizes. The dual-zone pads feature real mylar drumheads and real triple-flanged counterhoops for the feel you demand. The snare and tom pads are dual zone, enabling you to perform rimshots, rim clicks or assign other sounds such as cymbals, gongs and cowbells on the tom rims. The DM10 Pro Kit comes with premium SURGE Cymbals, the only serious choice in electronic cymbals. The kit includes a 12-inch SURGE Hi-Hat Cymbal, a 13-inch SURGE Crash Cymbal with choke and a 16-inch SURGE triple-zone Ride Cymbal with choke. Comprised of a genuine alloy cymbal coated with a clear sound-dampening layer, SURGE Cymbals feel like acoustic cymbals because they begin life as just that. The Crash and Ride cymbals feature large choke strips on the undersides for even more attention to accurate cymbal control. The SURGE Ride also features multiple-zone triggering on the bell, face and edge. The SURGE Hi-Hat Cymbal offers continuously variable control using the included pedal. The DM10 Pro Kit features an ergonomically curved, chrome-plated ErgoRack. It is heavy gauge, heavy duty and supremely adjustable. The ErgoRack is large enough to enable you to add on additional drum pads and SURGE Cymbals. You can even mount acoustic drums, cymbals, and percussion instruments on this roadworthy system. It employs standard one and one-half-inch tubing for compatibility with virtually all drum manufacturers’ rack hardware. The rack features quick-release, metal clamps for fast setup and tear down. The Crash and Ride cymbals mount on large, knurled boom cymbal arms that are height adjustable right in the rack down tubes. The DM10 Pro Kit comes with tom mounts that enable freely adjustable mounting. Drummer-friendly wing-screws are present on all important rack clamps and pads for ease of adjustment without reaching for a drum key. The drum pads mount on standard 10.5mm L-rods with low-slip, knurled mounting surfaces. Experience electronic drumming like never before with the DM10 Pro Kit, only from Alesis. Packaging: (WxDxH) 29" x 13.25" x 42.5"